Thanks for your interest in the Butler County Historical Society. 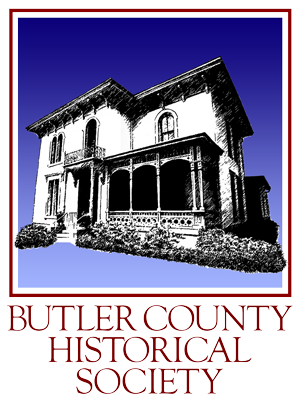 The BCHS is a non-profit organization dedicated to the preservation and interpretation of Butler County’s rich heritage. The mission of the BCHS is accomplished in a number if ways, including periodic history programs that feature reputable and academic speakers. The BCHS operates out of the historic Benninghofen House. The Benninghofen House is a showcase of Victorian Era lifestyle and includes all the furnishings and decor appropriate for a late 19th century home. A tour of the house reveals what life was like during the height of the industrial period, and also showcases many of the society’s prized possessions. Additionally, the BCHS manages an archive that consists of many original and secondary documents, publications, photographs, etc. If interested in research, please schedule an appointment with one of our research volunteers. The BCHS is also affiliated with Heritage Hall, a space for the display of rotating exhibits and the permanent location of the Robert McCloskey Collection. To learn more about Heritage Hall, please call (513) 737-5958. In 2018, the Historical Society assumed operations and management of the historic Soldiers, Sailors and Pioneers Monument on Front Street in Hamilton. Visitors to the iconic monument can explore the names of several thousand soldiers engraved on the marble walls, view the beautiful stained glass windows honoring the role of women during wartime, and experience rotating exhibits featuring educational information about Butler County history and local figures.